Thank you Julia, Nadine, Trekbeez, and M, for your support, suggestions and lots of girltalk! The picture I took myself when I went to Versailles in April. 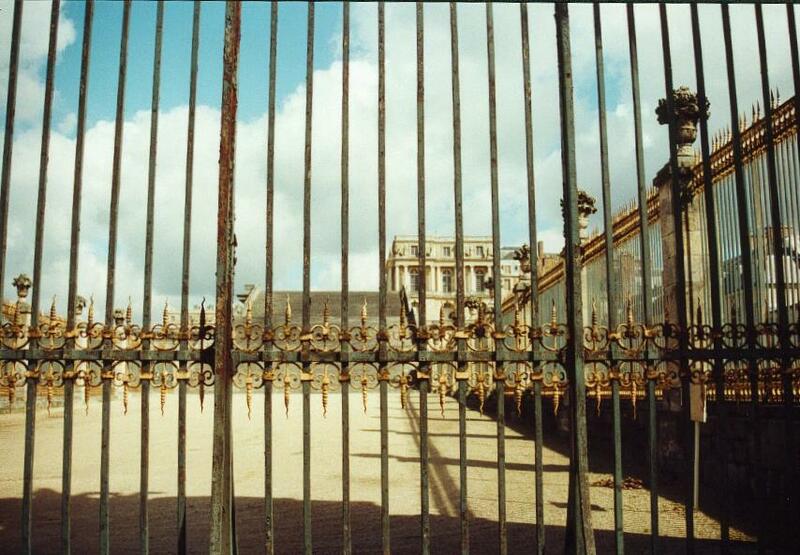 A golden fence still is a fence, and it didn’t stop the common people to take over the palace and bring the royal family to Paris, where a cruel destiny waited for them. And a palace, although it may be luxurious, can be like a prison, with rules and no possibility to be yourself. J’ai fait cent fois la valse, et cent fois la chamade. I danced the waltz and my heart beat a hundred times. I can’t allow myself to think about her in my spare time, so I try not to have any spare time left. But when I crawl in my bed, my body sore and aching, exhausted from my physical ordeals, she always returns in my mind. Not one night, but every night. I tried to avoid the books of Dante, who wrote about a lady called Béatrice. I know that when I would start to read his books again, my desire would become unbearable, without any doubt. So Dante’s words keep me close to the memory of her image, the memory of her lips, the kiss, her flesh against mine. And the longing of my heart. Strangely, in his words I find some consolation. And, sometimes when I am overcome by emotion and tears are dropping on the blankets of my bed, I feel I am not alone. Of course she is Marie-Antoinette. The woman who left Austria as a girl to marry le dauphin Louis. The woman who became the queen of France when Louis XV died and who finally gave birth to three children, a girl and two boys. But to me she is Béatrice, queen of my heart. And she always will, even if it is unlikely I will see her again. Antoine, Jacques, Dominique and Lady B, they all look expectantly at me, when I read the letter aloud in front of them in the library. I still haven’t overcome my amazement and I find it difficult to steady my voice. It is more like a growl, coming from a rough emotion within me. But the content of the letter, written in urgency, shows clearly that there is no time for reflection. We will have to make a decision and act fast. Shall we go to Versailles? I am not alone in this. Without my friends I will not be of any help. They are my eyes and my ears. For every one of them I would give my life, and I am certain they would as well. I can tell a different story about each of them, but they have one thing in common. I was there when their lives became their hell, and I gave them a shelter in my castle. Now, we are all friends for life and we try to help others whenever we can. My hand is trembling slightly when I finish the last words. Antoine speaks up the first. With his boyish appearance he has a dynamic personality which I have come to appreciate greatly. "She is the lady you rescued, isn’t she, Jean-Charles?" "Why does she need our help," asks Jacques, a scar on his forehead marks his face. "I do not know, Jacques, but I am very eager to find out." Lady B steps forward, closer to me. She looks me straight in the eye, so I am unable to hide my emotions. "Tell me," she says, "tell us all who she is!" I step back. I have to tell them who she is. There is no time for denial, for lying. But I am scared. "Yes, I will tell you." "She belongs to the court. In fact she is the very centre of it." "Mon Dieu,"mutters Jacques. "Notre Dame qui êtes au ciel," begins Dominique. Antoine looks pensive, and Lady B shouts, "I knew it, I knew it, there was something about this lady, nom d’un chien, bon sang!" "This could become very dangerous," worries Jacques. I pat him on the shoulder. "I share your concern. I don’t know anything about what is going on in Versailles, but from what I hear people are not content with how things are going. There is the influence of the people who went to the other side of the ocean. They fought the English together with the Americans. It seems a declaration of human rights was written and they want to install those ideas in France as well." "Like Lafayette", adds Dominique. "Versailles is a spiderweb," he shares his thoughts. "There are always intrigues, people who want to manipulate the king and the queen in order to have more power themselves. Some of them may adopt those new ideas and try to find a way to replace our sovereign. If we mingle, I am afraid we will become involved. Why should we?" I listen with much attention to Dominique’s words. He is a very cultivated man, with much self-awareness, sometimes a little too much. But I care deeply for him and forgive him his pompous attitude. Then Antoine grabs my elbow. His words are full of enthusiasm, and my heart is grateful for his passionate words. "Listen to me… This is the queen we are talking about. I think we have an obligation! Besides that, we don’t know anything. Perhaps we can saddle our horses and find out what she wants." "Why you," Lady B wonders. "I am not sure," I reply. I turn to Jacques and Dominique. "Are you with me then?" I ask. "Only because I am curious. It will be quite an experience," mutters Dominique softly. "I go where you go, no matter what," Lady B says. "No," objects Antoine, "for a woman it might be too dangerous." Lady B glares at him. I speak before she can raise her voice. "She can be useful if we have to hide our intentions. A woman is less conspicuous." Grateful, with much warmth in her eyes, Lady B smiles at me. I close the distance between Jacques and me, putting a hand on his chest, and say with a throaty voice, "and you, are you with me too?" He takes my hand cordially. "I think there is a great risk we all lose our heads," he says with a very serious voice. A twinkle returns in his eyes, and his lips curl slightly. "But I will go to keep an eye on you, because clearly I cannot change your mind, and you need someone to cover your back, don’t you?" "Thank you my friend," I reply with the same twinkle in my eyes. I raise my voice. "Well then everybody, get ready. We will leave at sunset." Everybody leaves the room except Lady B. She takes me by the arm. "Catherine, are you sure this is a prudent thing to do?" "Did I ever turn away from danger?" "No, but this is different," she states. Belle doesn’t answer me right away, but instead she glares at me reproachfully. "I will be careful, ma Belle," I try to reassure my friend. "All I hope is that your vision is not blinded by your feelings," she says with a touch of bitterness. We left the castle in the capable hands of Eleonore and after three days we saw the first houses of the little village of Versailles. When we approached the enormous palace and the amazing park I felt a chill running down my spine. Mon Dieu,it was so impressive to see the massive building, the fountains, the lanes and the beautiful gardens with the rich diversity of flowers and trees. I took in the vision of this glorious building, so majestic, a symbol of the royal divinity, but so inhumane, cold and empty at the same time. Jacques, Lady B and Antoine went to Paris to find more information and to prepare us for Le Grand Couvert in the theatre Le Châtelet, a beautiful theatre near the river Seine. Meanwhile Dominique and I stretch our legs along Le Grand Canal, the large basin which dominates the park. Smaller canals divide the park in geometric forms. Everyone suitably dressed -and if you have no decent clothing you can rent a coat- can enter the park and even le chateau. Dominique, who is a skilful man in many ways, and I, are wearing clothes in the latest fashion of Versailles. At last we think so. My face is powdered, and my coat is adorned with golden needlework, little birds and feathers. I wear a wig so huge, my head is feeling very heavy, and a headache weakens my mental abilities. I am unable to walk quickly on the highest heels I ever wore. I am thinking that all this is ridiculous, but I have no choice. If I want to meet my Béatrice again, I will have to adapt to this masquerade. We walk along the canal. Little boats are sailing on the water, and I can understand why they call it "Little Venice". Now and then I hear laughter coming from one of the boats. The sun is shining warmly above our heads and the view is sublime. Sculptures decorate the park, lovely Greek gods entangled with one another in an embrace. I try to overhear the conversations of the noble people we pass. But nothing is demanding our attention.
" A lot of chit-chat," I say. "Yes," confirms Dominique, who has covered his bald head with an enormous wig. Long snow-white curls are running down his back. "I suppose there is nothing to worry about when you live here." "Perhaps," I say, giving a handkerchief of pink satin to him, because drops of sweat are running down his face. "Appearances, nothing but appearances," he exclaims as he wipes his face, "you don’t know what is going on behind closed doors." In the approximate distance I see a carré of trees and bushes cut in a very special way. It must be le labyrinthe, a labyrinth composed of bushes where you can play hide and seek. Perhaps we can find some answers there. "Let’s go there," I tell my dear Dominique who is regretting profoundly he selected the most extravagant hairpiece he could find to wear. "And please, try to make use of your formidable brain," I joke, "I don’t intend to spend hours in there." "Of course," he replies promptly, not noting my teasing tone. We crossed l’entrée of the labyrinth, and after turning to the left, right, left again, we can hear a woman’s laughter not far away. A man is laughing too. They are not moving because at each turn we come closer to where they are. Suddenly we are very close, because we can overhear the couple easily without being noticed ourselves. One range of bushes separates us. "He must be dead," the woman says. The man doesn’t speak very audibly, so we are unable to identify his reply. "And the necklace?" the woman is asking, " this is something you can use to write about, cher ami, don’t you agree?" The voice of the woman, with a slight accent, reminds me of the voice of Béatrice, but I am not entirely sure. "Je suis d’accord avec vous, I agree with you," the man says. "What a ridiculous idea to raise taxes. It is a rumour, perhaps untrue, but if it is not, mon Dieu, alors c’est la fin, it is the end," the woman exclaims. It must be Béatrice, but her tone is so different. I put my finger on my lips and I make it clear to Dominique that I will try to peek around the corner of the bushes. I only hope my wig will not betray me. Very slowly, keeping my balance with difficulty on those heels, I approach the end of the range of bushes. Then I peek through the leaves, and my heart jumps in my throat. There she is, my beautiful lady, Béatrice, alias Marie-Antoinette, the queen of France! I nod silently and Dominique joins me. He has a look for himself. Béatrice, ma reine, wears a blue dress that matches beautifully the colour of her eyes. The wig she is wearing is twice as big as mine, and attached to the locks of hair are little miniatures, birds, flowers and even a boat. I wonder, how can she enter a carriage like that? But of course she will have an adapted carriage, with a ceiling much higher than usual. "Next week," she says to the man, "come up with a good idea will you chéri. Et avant que j’oublie, before I forget, were any of you invited for Le Grand Couvert?" "Strange," the queen says, with a smile. "Now what are you waiting for? Kiss me, you fool!" The man doesn’t hesitate a second, he grabs sa majesté by the shoulders and seeks out her mouth rather rudely. This unexpected spectacle makes me blanch. Apparently my Béatrice is not very selective in her choice of amants, lovers, and what a fool I am. A fool to believe that the queen had chosen me of all people, an unimportant count, to be the subject of her affection. Without thinking I step forward, leaving a startled Dominique behind me. I speak aloud, "this is the fourth time we’ve passed this spot. I think we lost track of the right way to leave this labyrinth, n’est-ce pas…oh pardon …Majesté …pardonnez-moi please forgive me for interrupting." And I bow as deeply as I can, my wig almost touching the ground. Dominique joins me and follows my example. Béatrice, but I think I should call her Marie-Antoinette by now, looks not embarrassed at all, although she must have recognised me and I surprised her in a compromising situation. Maybe she wants me to hide my identity in front of the man. It is the only reason I can think of why she asks my name. "Votre Majésté je vous présente mon frère, my brother Duke Alphonse de Seradan, et moi-même Charles." "From the province, are you not?" and she laughs again. "I can see that," she continues to laugh. She is making fun of us. But I try not to lose my temper. Marie-Antoinette stops laughing. "Have you never heard of l’étiquette? And the way you are dressed, c’est ridicule, it is ridiculous! The man starts to laugh, and I cast him a cold glare, which makes him laugh even more. Domique senses I am about to say something not very nice, so he takes over before I can speak. "We didn’t mean to be impolite, Majesté. Forgive us this breach of etiquette. And most of all, will you be so kind to tell us how we can leave the labyrinth? For, as you may understand, dans la Province we don’t have such a thing and so we are easily lost." Marie-Antoinette begins to laugh again, and tears are running from her eyes. I think we should not pursue the conversation. Apparently we are only the objects of wit, and strangely enough I don’t feel anything anymore for this woman. Everything she represented, the tenderness, the kindness, and even her tragic demeanour, which seduced me so much, everything has gone. How can this be? Is she Béatrice, the woman who left me her ring, a token of love? Is this woman Béatrice who pressed her lips against mine? It is. She is standing right in front of me. But then again I am puzzled, I have never known her like this, and why did she write me the letter? Could it be that this is just a facade? Is she acting? And I am well placed to know if someone is hiding his true identity. Being a woman and living like a man for a large amount of time now. "Alors Madame Votre Majesté, allow me to recite Racine, because books we do have. Like Phèdre I came into the labyrinth with you. Will you come the whole way beside me? To guide me back? Or will I be killed in here beside you?" Puzzled she looks at me. Does she understand? I am uncertain. She gives me her hand, without a reply. The man looks strangely at me. I kiss the hand of the queen, ready to leave the odd couple. Then the man says with a menacing tone in his voice, "if you are not prudent enough, indeed you will be killed. So obey your queen. If not, like in the legend, when you are lost in the labyrinth, the minotaure will leave nothing of you. Why not return to where you come from?" "Monsieur, I will find my fil d’Ariane," I reply, "the thread of Ariane." Dominique bows. "Come," I say with a harsh voice, unable to control my anger and disappointment. I look back and the man is kissing Marie-Antoinette again. His hands are moving eagerly on the upper part of her body, and she presses her own body against his legs. The sight is hurting my eyes. "How I would love to duel with that man!" "Then he can prove to me he is a real man, because underneath those clothes I know there is a coward". "Left. I suppose you are right." I sigh, "I don’t understand it at all. She acted so strangely…"
"Right." Dominique agrees, "perhaps because of this man she couldn’t speak freely." With relief we leave the labyrinth. I walk as quickly as I can, with Dominique in my tracks, in the direction of the palace. Outside the park, near the gates, a carriage can be hired to Paris. "That is the only reason I can think of. She seemed so different, not at all like she behaved in the castle, much less like a queen, if I may say so." "Perhaps the others will come up with some information," suggests Dominique, who perspires enormously, leaving a trail of drops of sweat behind him. "I hope they will. If not, this journey was a waste of time." We go to the right, so that we can cut short the distance that separates us from one of the main entrances of the park, near L’Orangerie and the vegetable garden of the king. I feel anger rise again when I think of the way she made fun of me. "What is it about the etiquette anyway," I spit. "You are allowed to speak to the queen only when she addresses you with a question." In Paris we managed to obtain some of the pamphlets. Songs ridicule the royal family and especially Marie-Antoinette, who has many nicknames, like "The Austrian Whore", and "Madame Deficit", because they say that she spends so much money, ruining the country with her debts. There is much tension in the air. Duels take place very often, because the people are agitated, which I can understand. The conditions in which the poor have to live are horrible. And not only the poor, also the craftsman, the merchant, the baker, the needlewoman and the cook. Many homeless people live on the streets, which are dirty with mud, excrement and garbage. The smell of filth never goes away completely, especially near La Seine. Food is extremely expensive, and every night someone dies in the gutter from starvation. "Just one flame of a candlelight, only one flame it takes, and Paris will burn," I murmur as I watch the theater Le Châtelet, where Le Grand Couvert will take place. And who is really to blame? The royal family? The nobility with all their privileges? The clergy? Or is it bad luck. Is it the war in which La France participated? Or the bad weathers which ruined the harvest? I am unable to tell. But I am ready to return to Milou, where my castle is, ready to see my friends Theodore and Eleonore. Yes, I am ready, but not before I have an eye to eye with Marie-Antoinette again. Not before I know for sure that Béatrice was a woman only existing in my imagination. Jacques, Dominique, Antoine and Lady B are standing not far away from me. Carriages are driving off and on, and depose the noble guests in front of the entrance of the theatre. They are dressed in their most exquisite clothes. Some of them are shouted at in the most violent way. Then finally, in the last carriage, the royal couple arrives. Because we are standing in the middle of the crowd, I can sense very clearly the hostility of the people around me. There is a silence, nobody cheers, nobody applauds. But I hear no yelling either. After a few moments we are allowed to enter the theatre. We are forcing our way in order to be as close to the stage as possible. The table with the food is set for the dinner and the noble guests are seated already. The king and the queen are entering the stage. Marie-Antoinette wears a red gown made of velours, velvet. The dress is simple in comparison to the dresses of the other members of the court. She doesn’t wear a wig, but her blond hair is tight up in a bun with gives her a very stately demeanour. How she looks different from the woman whom I met several days ago! Seeing her like this takes my breath away and reminds me that perhaps my Béatrice is not gone forever. There is a silence, the court people are standing up and bow. Then ses majestés are sitting down and beginning to eat. A man, very tall, is standing near the stage and blocking my way. I speak to him in my lowest voice, with my eyes pinning into his dark soul. "If you want to survive the day after tomorrow, I’ll suggest you move Monsieur." "Or what," he protests, "I want to have a good look at the queen…"
"Even when I tell you," I interrupt him, "that not once I lost a duel, and that your massive body will be defenceless against my merciless attacks." "He is not joking my friend," adds Jacques behind my back. "You are a dead man," insists Antoine. "Go. It will be the wisest thing to do if you want to keep hanging around on this earth a little while longer," Dominique points out. The man is trembling in his shoes by now. "Who am I to argue with you people then," he says, and disappears. Now we have an excellent view. The crowd moves in and out of the theatre in great disorder, speaking aloud, and yelling, while the counts and dukes have their fist bite. The table occupies the whole stage and the royal couple is seated in the middle. A large number of chairs on the left side of the table are unoccupied. The king is eating with appetite, but Marie-Antoinette hardly touches her food. Instead she is watching the crowd and she looks worried. "Lift me up a little," I order Jacques. Even if I wear high heels after the latest fashion, I am endowed with a small frame. Jacques does as he is told, and with his strong arms around my waist he lifts me up, so I can tower above the other people. Marie-Antoinette, or should I call her Béatrice by now, recognises with apparent relief my red coat, and with a little smile around the lips she whispers something to the king. He nods to several guards, standing nearby. They jump off the stage and disappear in the crowd. One of them looks at me. "You and your friends," he says, "are invited by Sa Majesté to join Le Grand Couvert". At random other civilians are told to participate as well. We all gather together on the left side of the table. La noblesse is baffled, but they continue to eat with much stoicism. So, what will come next, I wonder. It is quite an act, un coup du théâtre, to invite civilians to Le Grand Couvert. People were allowed à Versailles to watch the royal family eat, not to eat with them! And this time it is clear that she recognised me. Maybe there is a meaning to it all, which I am unaware of, I muse. The theatre is rather impressive from this point of view. There are at least five balconies, and the ceiling is decorated with images of angels and Orpheus, the Greek god of the arts. If you are performing on this stage, even if you are incredibly talented, you will need the help of Dieu as well. And to have dinner several times a year in front of this huge crowd, I do not think it is an easy task. "Take a bite," recommends Antoine, "the food is delicious." "But why?" says Lady B, always asking the right questions. "It doesn’t seem to serve any purpose." "I am not sure," I whisper, because the king stands up and moves towards us. "Mon Dieu," mutters Dominique who is impressed. I stand up quickly and offer my seat to the king, as elegantly as possible. I have to admit, seeing the sovereign this close for the first time, it impresses me as well. Kindly he speaks. "Merci. Merci for saving the life of my wife. It is not something I will forget easily. Please, don’t hesitate, continue your dinner next to the queen. She wants to talk to you." But while I meet his friendly eyes, I realise that he is a kind soul, something, I have to admit, I was not expecting. His eyes are without any trace of contempt or arrogance, only kindness, and I like him instantly. I sit down next to Marie-Antoinette, afraid to look at her, my heart beating like irregular clockwork. A lady changes places with Lady B, who now flanks the queen on the other side. To my surprise Antoine trades places with an earl, and so this switching of seats continues until the common people eat side by side with the aristocratic people. Soon the king and Jacques are talking with animation. Probably about hunting because Jacques knows everything about the wildlife of the forest and the king is a skilled hunter. As for me I am unable to speak a word. Marie-Antoinette tries to attack the fish on her plate, apparently with much effort. Suddenly there is a loud voice coming from the crowd. "Vive le roi ! Vive la reine !" Marie-Antoinette smiles. Other voices follow and within a few moments the entire crowd is cheering with enthusiasm. I watch closely the expressions on the queen’s face. Tears come up to her eyes, and she glows from the inside out. Because my emotions are too close to the surface I am afraid my words will fail. So I let Lady B begin the conversation. "This was all set up, wasn’t it?" Marie-Antoinette slowly turns her head. She speaks softly "don’t you see Belle de Thorigny, the love of my people, that love is all to me." Her words move me so much I am moved to tears myself. How can she be the woman in the labyrinth? She is so lovely, and yet so fragile, imprisoned in this cage of etiquette. She is love, she embodies love, and even I believe she receives love from a greater source to illuminate and give strength to the people she comes in contact with. I turn my gaze to Lady B and I see for an instant something that was well kept hidden, something I should not have seen, cold and originating from the darkest corner of the mind. She flickers her lashes and then it is gone. It was a look of hatred and jealousy, but it was only for a second, so maybe I was wrong. Lady B smiles. "Then you must be very loved." Marie-Antoinette looks at her plate again, and sighs. "If you only knew," she answers with a tiny voice, "this love is killing me softly." After that she chooses silence. And yet she is the woman who made fun of me. The same intense blue eyes, the same statuesque demeanour, the same lips. The memory of her laughter makes me furious again. She is such a sweet talker, and I am too sensitive to this display of sentiments. It has to stop. She might be the queen, but I have my own standards and she has some explaining to do. Right here, right now. My anger is colouring my cheeks, and she must have felt that I am my indisposed, because she stops eating and says, " you want to know why I asked you to come. After dinner follow Madame de Lamballe. I will meet you before dawn, privately. Be patient." Then for the first time since this conversation started she lifts her head and bores her eyes into mine. My anger disappears in an instant. I only see Béatrice in those eyes, nobody else. "Don’t be long," I manage to get out between my lips, almost harshly. She turns to her dish. "Or what?" she smiles. "As your queen I order you to wait for me." "As long as it takes?" "Because in the end you are unable to resist me." We are not looking at each other while we speak. I contemplate the crowd while the queen finishes her dish, although with difficulty. I try to play the game all along, so I reply, "indeed you are the queen, and if I resist you, you can even kill me. But beware, death doesn’t frighten me, so you can do whatever you want, I will remain a free soul." "Death doesn’t frighten me either," she states seriously and without a smile. "What frightens me is the death of my three children, Louis, and…"
Again she turns her head slightly so I can look in those deep blue eyes. She watches me for a moment and then barely audible she confesses. I tremble because what I just heard might as well be a declaration of love. And again I catch the look of Lady B. It worries me. I have to take notice of this and be careful. She can be so short-tempered. "I will wait," I reply trying to sound very casual. "Until dawn, and after sunrise I will return to my castle and forget we ever met." I look at Lady B, and see that she is relieved to hear those words, thus confirming my suspicions. After the copious dinner we follow Marie-Thérèse de Lamballe, the lady who changed places with Lady B. We descend in the basement of the theatre and when we pass a heavy metallic door, we enter a dark corridor. Everyone lights a torch and we follow Madame de Lamballe, who apparently is familiar with this dark passage, because she shows no sign of anxiety at all. "Where are we going", asks Antoine who is impressed by the beauty of the lady. Not insensible to his good-looking features, she smiles, "to the island." "L’île de la Cité," I understand. "Why?" "Sa Majesté is accustomed to being the centre of attention, but she only feels safe in public when there is someone or something covering her back. Like this secret passage. Huge crowds are imprévisible, unpredictable, and easily manipulated." Lady B, just behind me, screams, and her scream makes me jump. Rats hide as we pass, and cold water is gliding downwards from the unprotected walls. "They say the soil on which Paris has been built is like cheese," Dominique recalls. We pass another corridor but we are heading just forward. After what I think must be a quarter of an hour, we are standing before another door. Madame de Lamballe opens the door with a key and stairs cut in stone are leading us to another door, this one much smaller. When we pass through it we find ourselves next to a pillar of the bridge which connects l’Île de la Cité with the other island, l’Île St Louis. "Come," gestures Madame de Lamballe, "the queen possesses a house on the island, un hotel particulier, which is situated just in front of the church. Not even the king knows of it. She goes there when the public life she is leading is too demanding." A quiet peace settles in my heart when I gaze through the window. Just in front I see the facade of the church. The street is narrow and very quiet. If I close my eyes I can imagine I am in the safe harbour of my castle, a shelter made of bricks, a shelter for my restless heart. Madame de Lamballe has left us alone and given us the keys to the house. Antoine lingered a bit when she left, as he spoke with soft tones with the gentle lady. I am in the kitchen now, ready to take a bath. Lady B is poking in the fire, roasting some meat. The men are playing cards in le salon, and I hear them talk with much laughter. The bathtub near the fire is filled with warm water. Not because I am a prude but because I don’t want anyone to find out my real nature, I bathe with a large chemise-a sort of nightgown-of flannel. I don’t expect Marie-Antoinette to come soon. De Lamballe told us she had to return to le Palais des Tuileries first, where she keeps a couple of rooms. She has to perform several rituals, and it will be no doubt not before midnight that she can escape the palace, which is situated in the center of Paris. I take off my clothes in a hurry and put on my chemise. Then I lower my body in the water. "Belle," I sigh, "really, don’t deny this to yourself. It is heaven!" Lady B smiles with delight. "I will put some oil in the water", and she empties a precious looking flacon in the tub. At once it is not longer the faint odour of La Seine that I smell, but an exotic flower. At home, when the weather permits it, I swim in ponds, and even in the river, always with some clothes on. I like to swim, and amuse myself in the water. My body is that of a small-framed woman, muscled, especially my legs and my right arm, and it is covered with scars from many duels, wounds which closed badly and which will always remind me of my life as a man, even if one day I feel like living the life of a woman again. But my shoulders are very feminine, and I have always problems hiding my hips and tummy. As for my breasts, fortunately I am graced with breasts which I can conceal enough by binding. Without the bandages my womanhood would be clearly visible. Sometimes, like now, when I will have my period very soon, the bandages hurt and my breasts are aching. Because of this I am feeling more sensuous than ever, and in great anticipation of the arrival of Béatrice. I close my eyes with much delight, enjoying the soothing warmth of the water and the smell of the exquisite flower, l’odeur du printemps, the scent of spring. I will remind Lady B to take some extra bandages with her when she accompanies me. In the castle I have secret hiding places and I burn the bandages afterwards. When we travel Lady B takes care of all that. Suddenly I feel her hands on my shoulders. And she begins a massage to soften the tense feeling in my muscles. I don’t object. I close my eyes again and try to relax for a while. In my mind forms the image of Marie-Antoinette during dinner. Is it true what she said? Is she afraid of losing me? Or am I just very naïve, at her mercy, because I am too sensitive to her beauty? I want answers before I allow myself to engage in this adventure any further. Who is she really? Béatrice or Marie-Antoinette? I have to put my feelings aside, not only for my own safety, but for my friends as well. Then the memory of the kiss comes to my mind, the softness of her skin, tantalising underneath my fingers, those lips so gifted and sensual. The locks of blond hair tickling my face. Flames of burning fire are again agonising my body. Adding to that the sensations which Lady B is offering my body by her massage, I am helpless and a moan escapes my mouth. Belle takes it for an approval. So her hands linger underneath my chemise, and their purpose changes. Her hands become more caressing, stroking my neck, shoulders and back. She even begins to cup eagerly my breasts with pressing touches. My body reacts to her caressing strokes, but I try to regain my senses and before she can continue I take hold of her hands on my breasts. "Don’t," I say as calm and gentle as possible. Furious she struggles to free her hands and she spits at me, with disdain and contempt. "Why not, your body seems to like it! Don’t say I am mistaken! "I am truly sorry," I whisper softly, "I love you…as a friend, but I am not in love with you." "Yes, because you are in love with that woman, the whore of Versailles! I can’t believe it. You really believe she loves you too, don’t you?! She is playing tricks on you and you are letting it happen! She is only lusting after your naked flesh, can’t you see that!" Lady B is upset, but I try to make her see things clear. So I talk slowly and my voice in a low register. "Maybe so, but the fact remains that my feelings for you don’t change. Why don’t you accept that, hard as it is? I can pretend to love you too, but you have to agree, it won’t get us any further, will it?" Outside a carriage arrives. Lady B doesn’t seem to notice, but I am alarmed. I have to get out of this bathtub quickly. Belle continues her tirade, while I try to think. Is there enough time to be clothed again? "I am the one who is always with you when you are in trouble," Lady B says, almost on the verge of a breakdown. "I put everything aside to be with you, I would give everything I have, if it would make you love me…"
I stand up, the chemise is clinging to my wet body. "When you return to me, when she will be finished with you, and believe me, she will, I will be there for you, because I love you," she sobs. With one swift movement I lift the chemise over my head exposing my naked body to her eyes, thus trying to unsettle her. "Look at me," I order, and she looks at me through her tears, her cheeks flushed with emotion. I try to keep my voice low and commanding. "I have let you come close, very close, closer then anyone else. I never asked you to do those things. It was of your own free will. And I never lied to you about my feelings, so do not put the blame on me now." I step out of the bathtub. I will not have the time. I already hear the front door unlocking. I quickly grab my tights. Lady B is staring at me with a bewildered look, but I just don’t care. I have had enough of this. It is the same all over again. I hear footsteps approaching the door. In a hurry I put the tights on. "As I said, I have let you come close," I repeat, my back to the door. "If it is not enough for you, then you are free to go elsewhere." "Then I will go", Lady B says, and she leaves abruptly the kitchen, smashing the door behind her back. I do not have any time to bind my breasts, to conceal my feminine forms. I don’t move. I know she is standing outside the door. What is she waiting for? Will she come in, or will she go to le salon? Sometime soon I will have to reveal to her my secret, but will it be now?